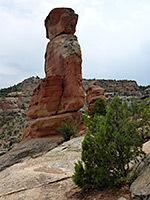 Devils Kitchen is a prominent group of pinnacles and fins of reddish Wingate sandstone capped by thin blocks of the Kayenta Formation, on a low ridge near the mouth of No Thoroughfare Canyon, towards the southeast edge of Colorado National Monument, reached by an easy 0.7 mile trail. 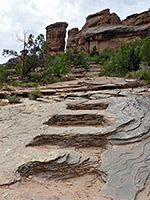 The formations were originally named King Apples Castle by explorer John Otto, who first popularized this area early in the 20th century, on account of the fortress-like walls that enclose a sheltered basin at the center, and the place is one of the more popular hiking destinations in the park. 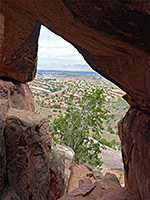 The rocks contain several cavities, alcoves and narrow gullies, and the location is high enough for good, long distance views, up the canyon and northwestwards towards Grand Junction, so although short there is plenty to see along the trail. Trailhead parking is near the southeast end of the scenic drive, just a few hundred feet from the entrance station, and it serves five trails, Devils Kitchen being the shortest route. 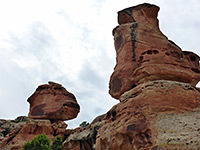 The others are to Echo Canyon (1.3 miles), up No Thoroughfare Canyon (8.3 miles), the Old Gordon Trail (4 miles) and the 1.7 mile Serpents Trail which follows an old roadbed as it switchbacks up to the plateau rim. Map of Colorado National Monument. 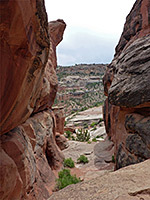 The trail to Devils Kitchen starts by descending slightly to a junction with the Echo Canyon/Old Gordon path, then drops down a little more to the sagebrush-filled valley of No Thoroughfare Canyon and forks left soon after, crossing the dry creek bed and climbing gently up a lesser drainage, past rocky outcrops, bushes and cacti. 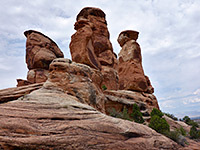 The final part is somewhat steeper, ascending a slickrock slope via constructed and rock-cut steps to the base of the formations, the main part of which is composed of two tall, parallel fins, creating the enclosed chamber, which has several entrances. 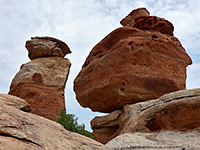 The pinnacles extend north and south. Due in part the popularity and the easy access, the lower surfaces are covered by much carved graffiti, while bolts fixed high up in a couple of places suggest this is a recognized climbing location.